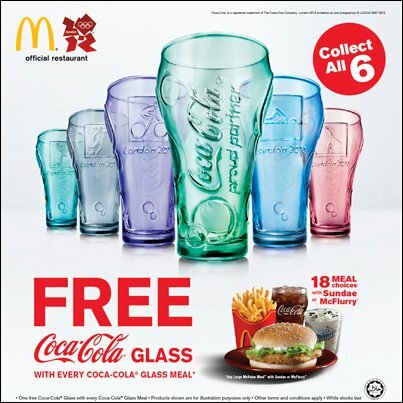 Limited Edition Coca-Cola London 2012 Olympic Games Glasses will be given FREE with every Coca-Cola Glass Meal at McDonald’s! There are six different colored glasses to collect, each embossed with the official London Olympic Games pictograms. CELEBRATE THE OLYMPICS WITH McDONALD’S! Start collect all six FREE glasses! Share this promotion with your friends & family ya!